1. Full-tile backsplash feature walls. 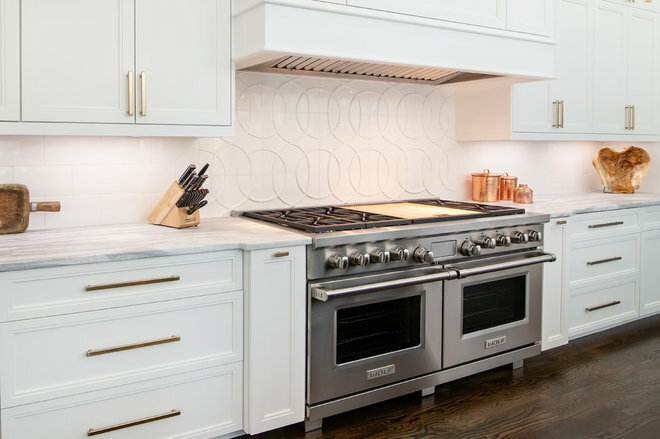 Attention-grabbing backsplash tile is nothing new in well-designed kitchens. We’ve seen colorful geometric and quirky patterns show up in a lot of kitchens for years now. 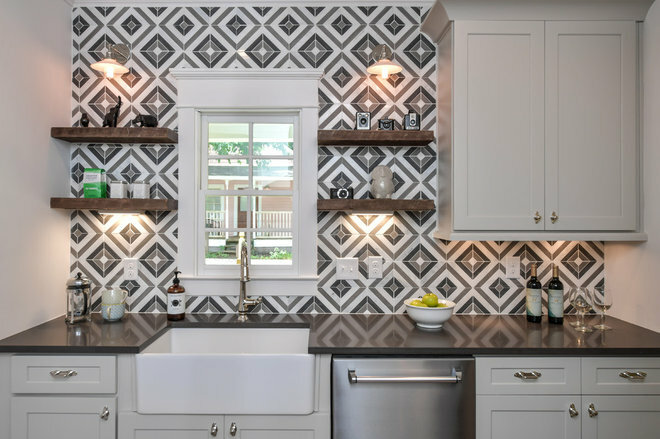 But what many professionals are seeing more of lately is an interest in taking the tile from countertop to ceiling, including behind floating shelves and flanking range hoods, to create a striking feature wall. This idea aligns with some broader trends as well. The 2018 Houzz Kitchen Trends Study shows that half of homeowners are opening up their kitchens to interior spaces, and that the most popular kitchen layout is the L-shape. This openness means the kitchen is always on display and therefore in need of a good focal point. A full-tile feature wall draws your eye in, whether through shimmer and texture with something like a simple white subway tile or through bold color and pattern as with a Moroccan design. It’s also a relatively cost-effective way to achieve a stunning effect. Buying an extra several square feet of tile won’t break the budget, but it looks high-end. 2. Window walls. Cabinet design has become much more efficient in recent years. Deep drawers on perimeter and base cabinets that bring items at the back of the cabinets out into the open means that fewer kitchen cabinets are needed overall. 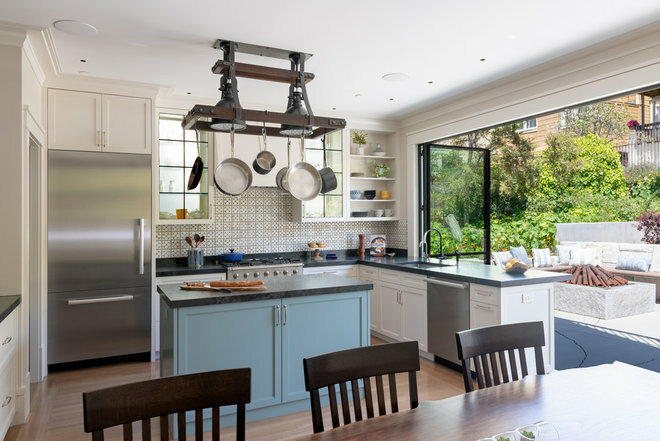 In response, designers and homeowners have shifted to removing upper cabinets on at least one kitchen wall, often to create an expansive window wall that can deliver views and lots of natural light. 3. Wood on wood (on wood). 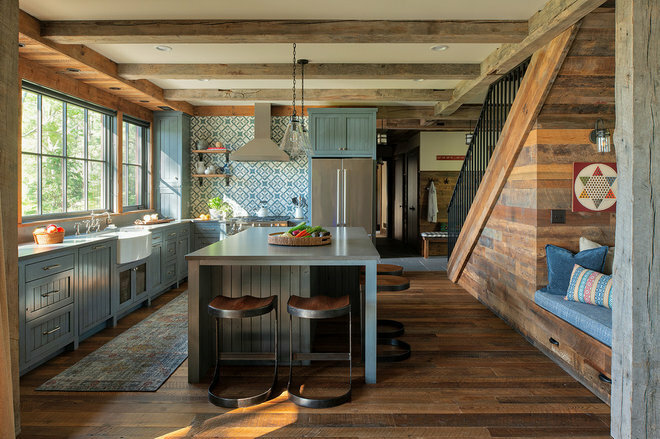 Many of the most popular kitchen photos in 2018 featured lots of wood, and it’s easy to see why. Wood adds loads of warmth and character, and it pairs well with whites and grays, two of the most popular colors for kitchen cabinets and walls. Ott says she’s seeing an increase in interest for medium-tone woods rather than super dark or light ones. 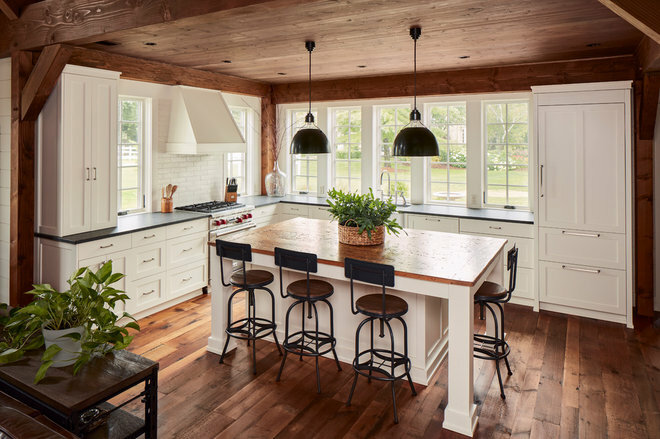 Wood also adds charm that aligns with the trend toward farmhouse style, which has been gaining in popularity every year for the past three years, according to the recent Houzz kitchen trends report. 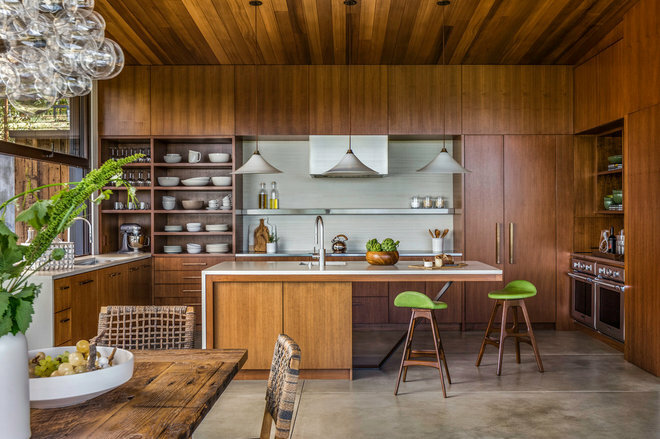 Gorgeous walnut wood cabinets and ceiling create a soothing, inviting atmosphere in this Healdsburg, California, kitchen by Claudia Juestel of Adeeni Design Group and Sutro Architects. Meanwhile, the white countertops and backsplash; steel countertop, shelf and appliances; and polished concrete floor cool things down. 4. Cream-colored cabinets. 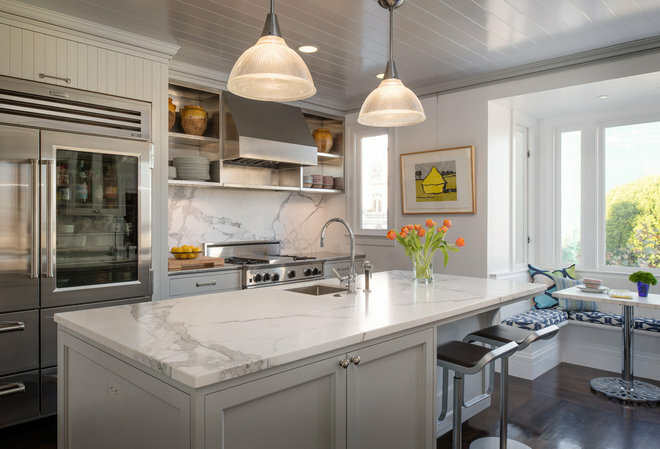 White is still the top choice for cabinet color, according to the Houzz kitchen report, but no two whites are created equal. Some paint companies offer more than 150 white paints — how do you choose? 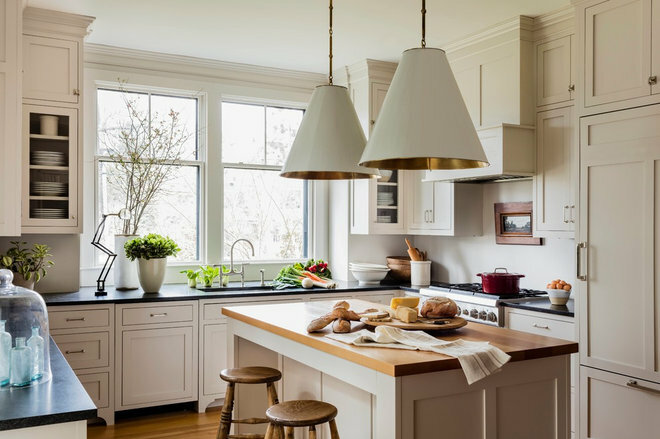 Many homeowners are moving away from the bright, stark whites and embracing off-whites that feel warmer and cozier, like Skimming Stone by Farrow & Ball, shown here in a Boston kitchen by Lisa Tharp Design. Creamy cabinets paired with other warm finishes like wood and brass and blue-gray tile create a calm and serene feel that works well with transitional and farmhouse-inspired styles, the two most popular kitchen styles. 5. Quartz countertops. 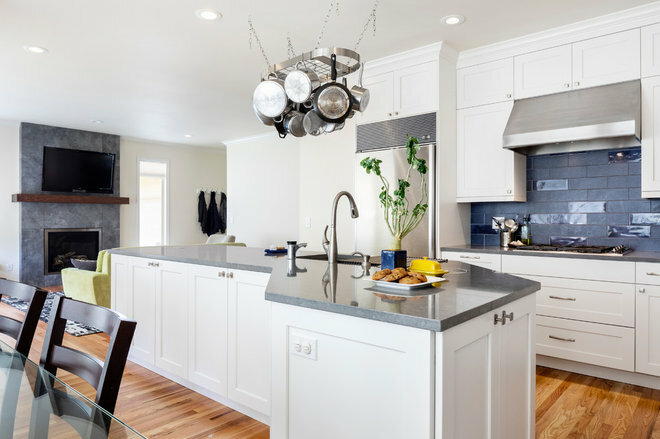 Engineered quartz was finally crowned the most popular countertop material in 2018 following a three-year decline in granite, according to Houzz research. The natural stone and resin material is incredibly durable and can visually mimic the look of more expensive and maintenance-heavy materials like marble and slate. 6. Emerald and deep teal islands. 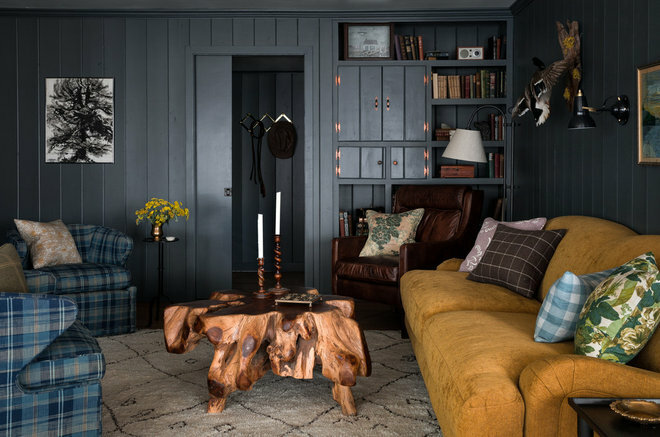 As you’ll see later in this article, darker, moodier colors seem to be catching on. 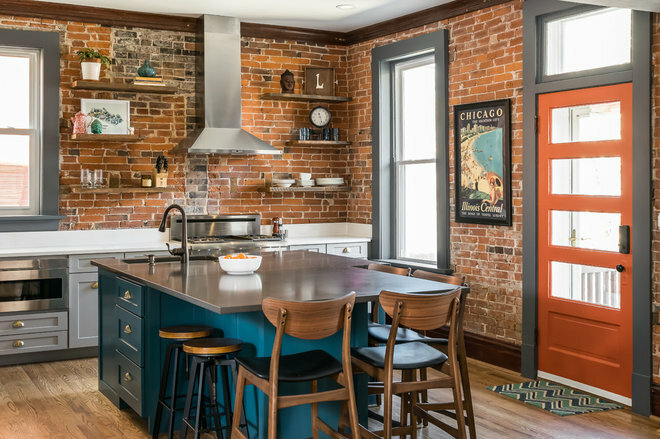 Mattison sees a lot of emerald and deep teal being used in kitchens, especially for islands, like the Deep Sea Dive by Sherwin-Williams on the island in this St. Louis kitchen by Jennifer Chapman Designs. 7. 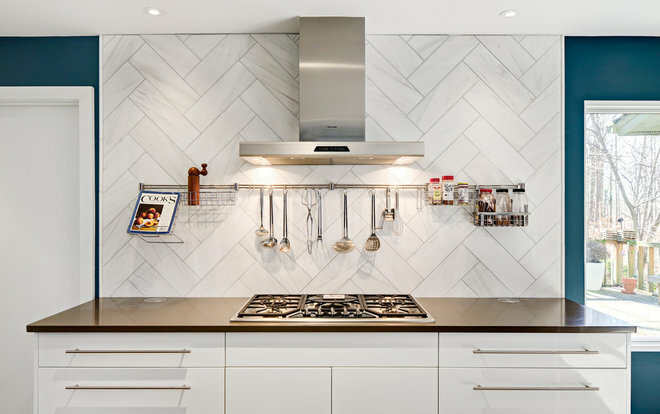 A new take on white subway tile backsplashes. A backsplash in standard white 3-by-6-inch subway tile is a classic look that works in almost any style of kitchen. 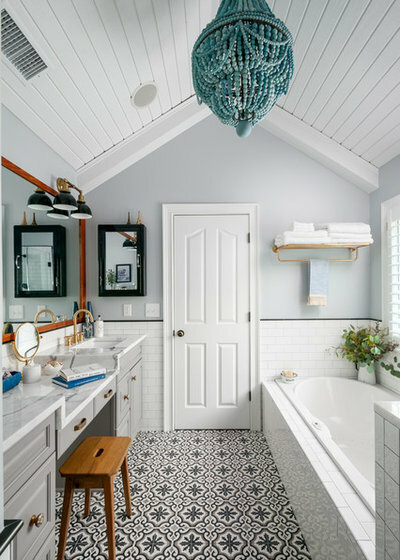 But as with everything that peaks in popularity, design fatigue can set in and designers and homeowners start looking for an alternative while sticking with the freshness of white tile. 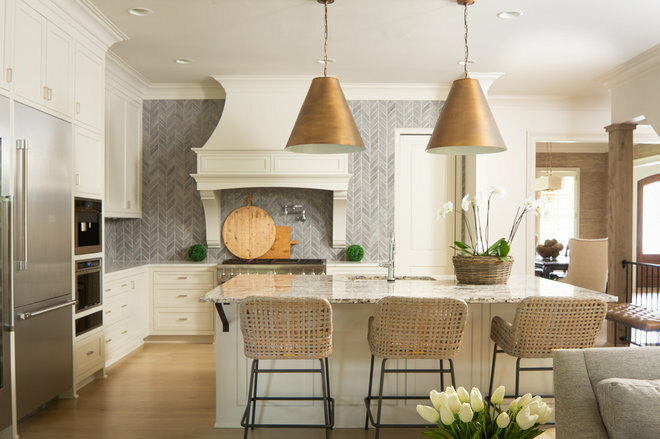 Larger-format tiles in herringbone, chevron or stacked patterns — anything other than the traditional offset brick pattern — gives the same crisp look but with a bit more nuance and interest, without taking a huge design risk. “With the larger size, the grout lines are minimized, and a clean, fresh take on the old is just what people are looking for,” Mattison says. Ott is seeing even more of a departure from standard rectangular tile. “Sharp, linear geometric patterns are being nudged aside by softer, curvier, abstract organic patterns and nature motifs,” she says. 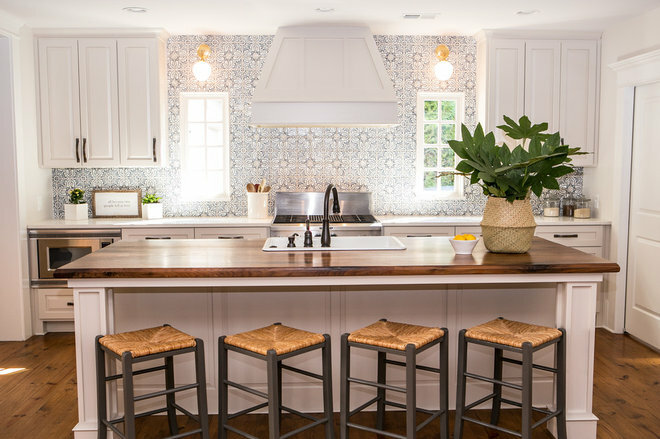 The circle-pattern tile in this Charlotte, North Carolina, kitchen by Walker Woodworkingand Greenbrook Design Center is a good example. 8. 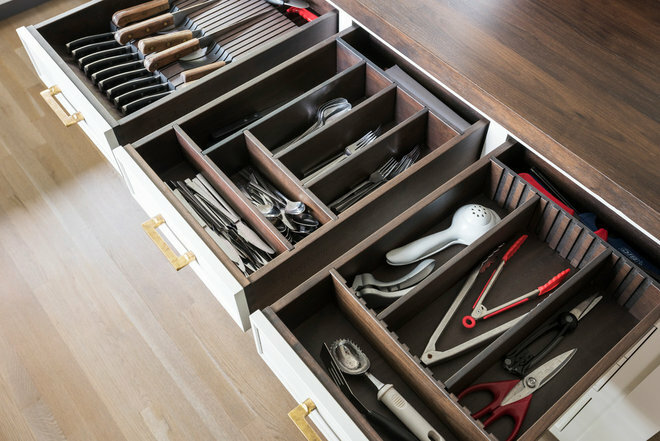 Custom drawer inserts in an unexpected color or stain. Designers often suggest that homeowners splurge on the areas they interact with the most. Cabinet hardware is a good example, because you’ll be touching the handles or pulls several times a day. But designer Sarah Robertson likes to go a bit further. 9. Kitchens that completely open to the outdoors. A single door connecting a kitchen to an outdoor area doesn’t cut it anymore. What homeowners want is a blurring of inside and out. Large sliding and collapsible doors give that feeling and help increase living space. 10. Countertop cabinets. A designer’s kitchen is always a good place to spot great design ideas. Going back to Robertson’s personal kitchen, you’ll see two countertop cabinets in each corner flanking the sink. Corners in kitchens often go unused because they’re difficult to reach and wind up being dead space. 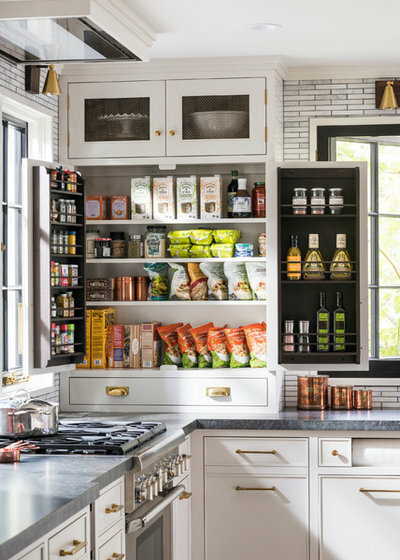 A tall cabinet with a drawer on the bottom creates a smart storage opportunity for quick-grab items like spices, oils and snacks. 11. Black is back. 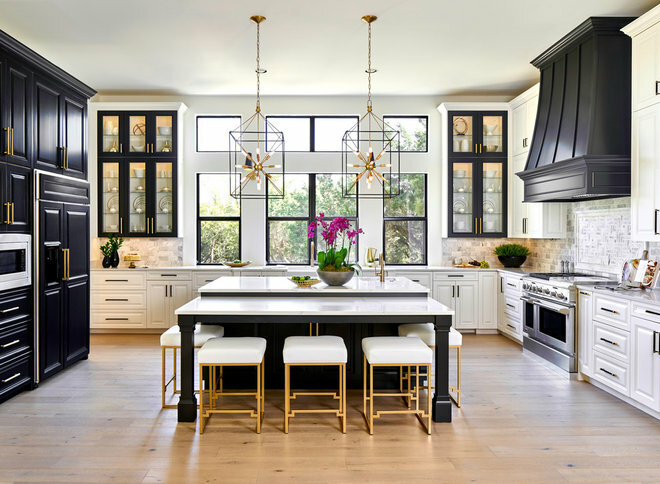 OK, it’s not like black ever went away, it’s just that we’re finding homeowners are more open to really taking a chance on embracing a heavy dose of the dramatic color in their kitchens. 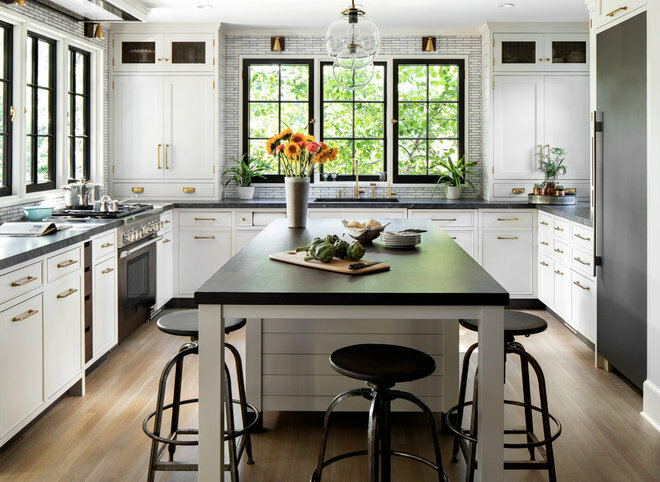 Large swaths of black range hoods, island accent colors and even full-on all-black cabinetry has been popping up a lot lately. 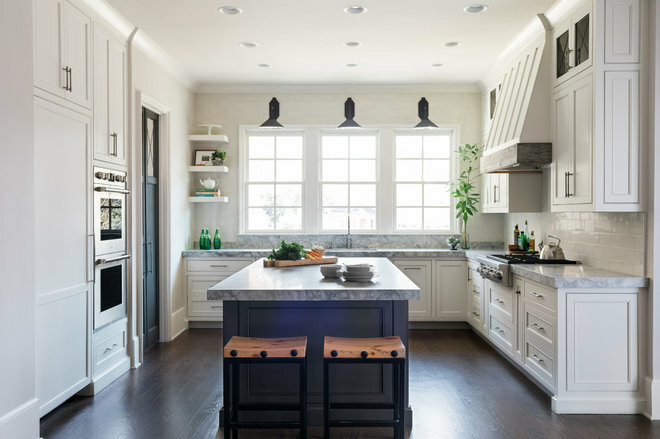 Many of the most popular kitchen photos uploaded to Houzz in 2018 featured black or dark cabinets. Pair black cabinets with white walls, backsplash and countertops for a dynamic, sophisticated and high-contrast look. Black’s reemergence is probably a reaction against all the whites and bright colors that have been popular for so long, Ott says. But there’s also a confidence element at play. Ask homeowners to imagine black cabinets in their kitchens and they might think you’re crazy. But show them a stunning photo and they might reconsider. 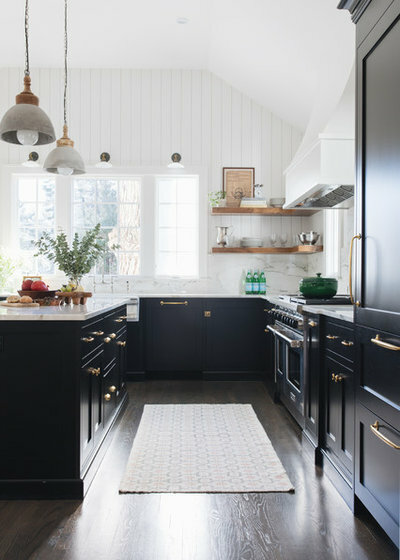 As homeowners see photos on sites like Houzz that show big doses of black cabinets or painted millwork, and as they work with professional designers and color consultants who tout black’s design strengths, they become more confident that they can pull off this elegant, luxurious look in their own home. 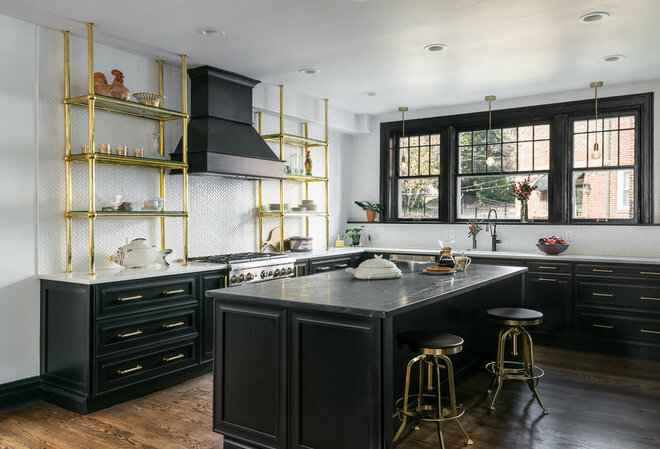 Karen Dubinsky of Marcia Moore Design says she used photos she found on Houzz to persuade her clients to go with all-black cabinets and trim in the St. Louis kitchen shown here. 12. Abstract island shapes. One of the most popular articles of the year on Houzz was about island shapes you might not have thought of. That might be surprising, considering that the majority of islands you see tend to be rectangular. But that just doesn’t work for every kitchen layout. Modifying the shape into something more free-form can open up circulation paths and create more work and storage space. 13. Gray, white and wood. 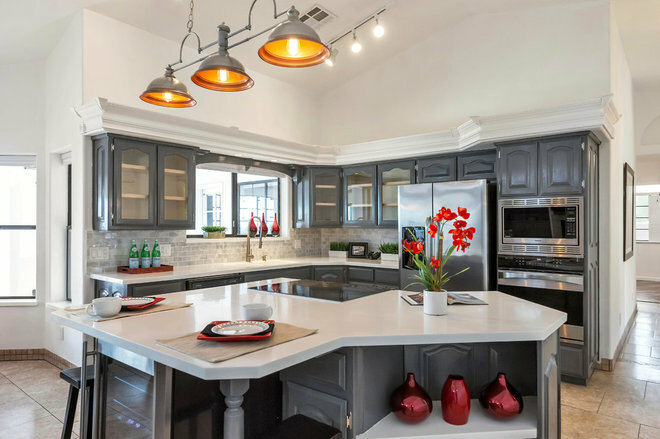 While the aforementioned kitchen trends will certainly show up again and again in 2019, it’s worth looking at what’s likely to be the most dominant kitchen trend. This photo of a Boston space by Hawthorn Builders is a good example of the type of kitchen you’re likely to see more of in the coming year. 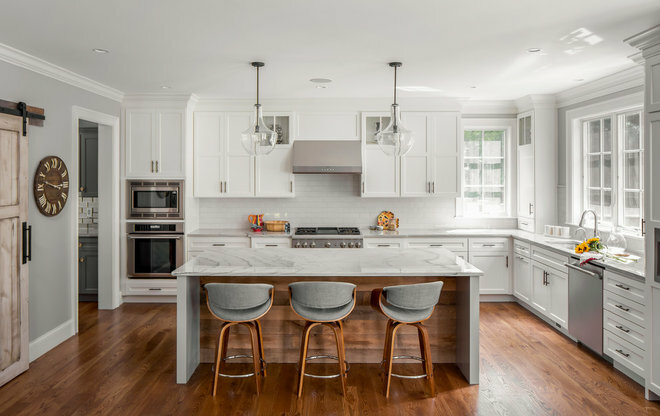 This kitchen combines almost every top trend from the recent Houzz kitchen report: an L-shaped layout, transitional style, white Shaker-style cabinets, white quartz countertops, gray walls, a white backsplash, wood floors and stainless steel appliances. 14. Destination bathtubs. There’s been a lot of debate over the years over whether you should keep a bathtub when remodeling your bathroom. But it’s clear that those who enjoy taking baths really enjoy taking baths. Couple that with people spending more to increase the size of their bathrooms and create a spa-like environment and you’ve got some homeowners who aren’t just keeping the tub, they’re celebrating it. The ever-popular freestanding tub is now more like a free-range tub, out in its own pasture, creating a destination all its own, with a great view and other accessories to turn bathing into a significant event. If you’ve got the room, it’s worth considering putting a freestanding tub off on its own. Most people don’t use their bathtub every day, so keeping it out of the more frequent daily path from shower to vanity makes sense. 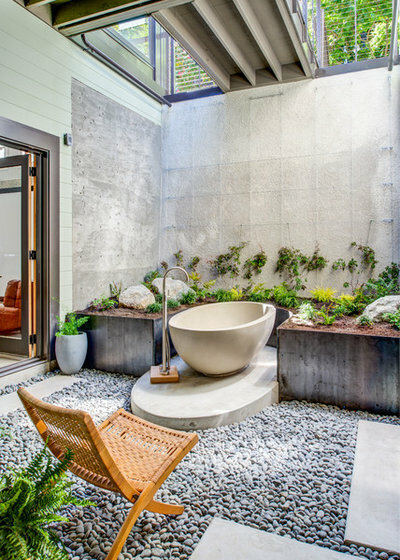 This destination tub by 20|20 Builders looks like you’d need a plane ticket to Bali just to have a soak. But all the San Francisco homeowners have to do is walk out their bathroom door. 15. Natural wood vanities.Bathrooms can often look and feel cold with all that tile, glass and metal. Wood vanities help bring a large dose of warmth. 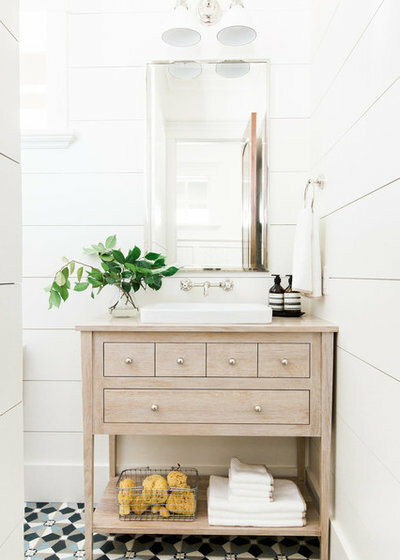 And while wooden vanities aren’t new, what’s catching on is a turn away from dark stained and lacquered vanities — which hide things like grain pattern and knots — toward reclaimed wood or light wood with clear stains that celebrate the details of the grain. 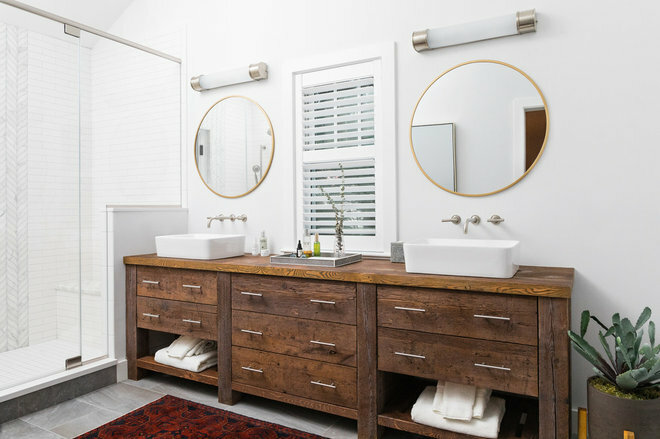 Here, a reclaimed-hemlock vanity stuns in a Boston bathroom by Realm Interiors. 16. Electric fireplaces. Going back to the destination tub and the idea of creating a spa-like environment in the bathroom, is there anything more luxurious to go with a good soak than flickering flames from a fireplace? Electric fireplace inserts are relatively low-cost and easy to install, so they can be a worthwhile investment for all the pampering they afford. 17. Easy-reach shower controls. Reaching in to turn on the shower in the morning and getting hit with a cold blast of water is no way to start the day. Relocating the shower controls to an opposite wall during a remodel solves that problem. You can see in this shower by designer Bronwyn Poole how the controls are on the wall opposite where you enter, far from the shower spray to the left. Talk to your designer and builder about the additional cost that might come from adding the extra plumbing to get this feature. 18. Painted shiplap. White shiplap has certainly been having a moment in recent years. And while its popularity isn’t necessarily waning, its look is changing. Painted shiplap, usually in grays or dark blues, is showing up a lot. 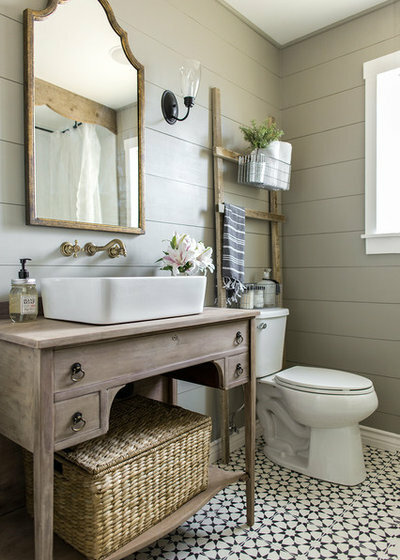 It’s a great look for bathrooms because it adds texture, dimension and character in a room that can often feel sterile. 19. Moroccan tile floors. Moroccan-patterned tile has been a popular choice for kitchen backsplashes and fireplace surrounds for years now. Increasingly, though, it’s showing up in large swaths as bathroom flooring. You get the clean feel of tile with all the color and style of a bold rug. 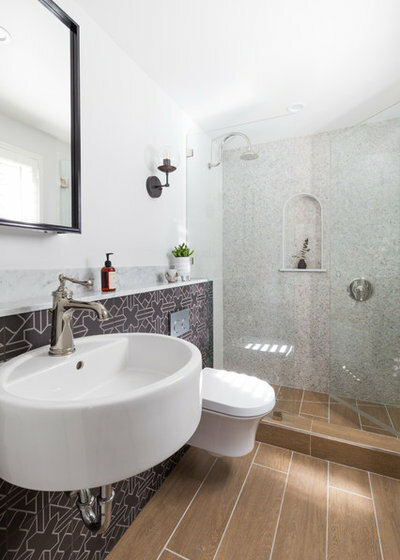 In this bathroom by designers Alexandria Hubbard and MJ Englert of Case Design/Remodeling, concrete tiles with various Moroccan-inspired patterns read as one pattern, and correspond with a shower niche. 20. Drying station. Few things convey a sense of luxury in a bathroom more than a designated drying station, as evident in this space designed by Howell Custom Building Group and Leana Porter of Shutter Dog Design. The station features an inset white oak drainable drying platform, a linen closet made of custom maple in a driftwood stain, a built-in bench and a skylight. 21. No-glass showers. Glass shower enclosures are great for controlling water spray while keeping an open and airy feel. But cleaning such enclosures is no day at the spa. 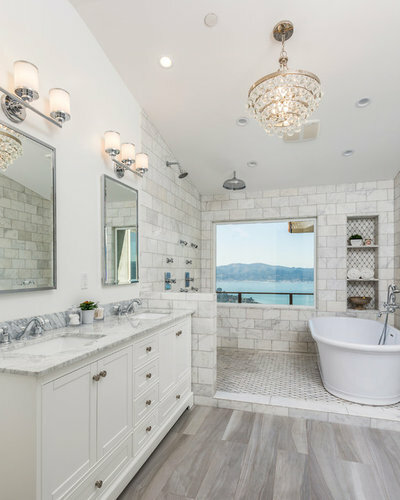 If you’ve got the room, you can create a completely open shower area like the one in this Tiburon, California, bathroom by Schneider Design Associates. 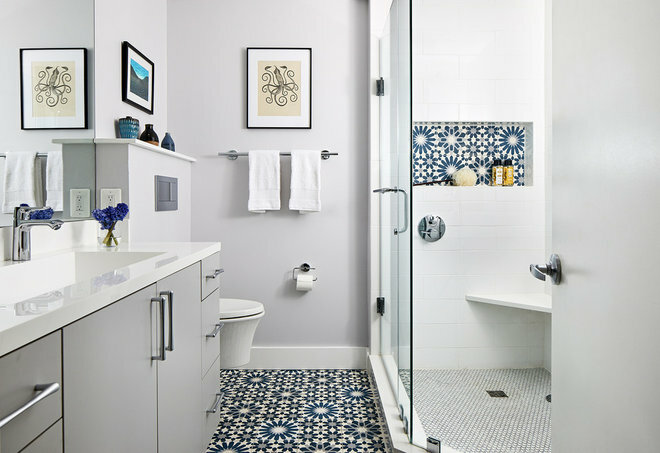 A small curb and partial wall offset a large marble-tiled wet area with enough room for multiple wall-mounted shower heads, a rain shower head and a freestanding tub. 22. Spanish style. Implementing Spanish-inspired style and other Mediterranean influences in a living room will automatically check a lot of the boxes on many homeowners’ wish lists. Light, airy, relaxing, casual, comfortable — these are all elements that come naturally with the style. Creamy white plaster walls, linen upholstery, a collected look, wrought iron light fixtures, large fireplaces and natural wood architectural elements like ceiling beams define this approachable look. In this popular living room photo uploaded to Houzz in 2018, designer Michael Ostrow of Grace Home Furnishings used rich coffered ceilings, an iron chandelier, a jute rug on tile floors, a pronounced fireplace and stately chairs mixed with laid-back sofas to create a breezy atmosphere in Palm Springs, California. Large wood beams and corbels, a soaring ceiling, oversize fireplace and mantel, antiques and inviting furniture feature in this Spanish-influenced living room by Chris Hutchens of Summer Classics. 23. Mix of fabrics. “After years of iconic midcentury modern furniture being all the rage, there’s a shift toward softer, more comfortable pieces that have a ‘lived in’ vibe,” Ott says. 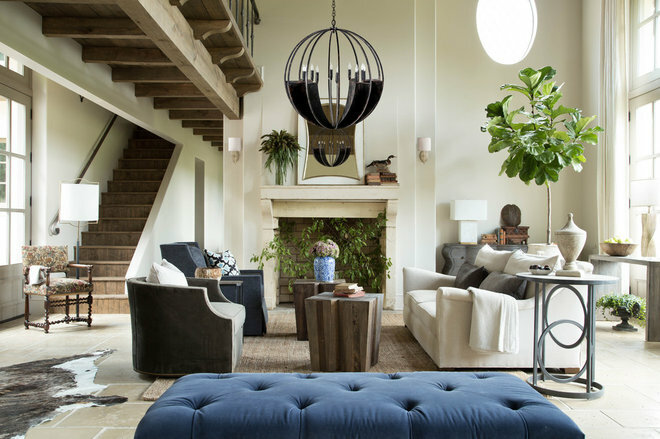 One way designers and homeowners are embracing this is by mixing various fabrics and patterns for a generous collection of textures and sheens. This New York living room by Studio Aubergine Interior Design features a mix of leather and upholstery, a deep-pile rug and textured wallpaper behind the display shelves. In this home built by David Weekley Homes, the living room offers a good mix of textures and sheens. There’s the smoothness of the suede chairs and linen sofa and the textured surfaces of the sofa pillows and jute rug. Add in the wood trunk and side table, a leather stool and drapery and it’s a winning combination. 24. Custom wood wall treatments. No, this isn’t the wood panel wall look of yesteryear. Rather, many designers are creating custom wood feature walls as a way to add warmth and texture. Mattison had the wall shown here handcrafted out of tongue-and-groove flooring, with the “tongue” removed. 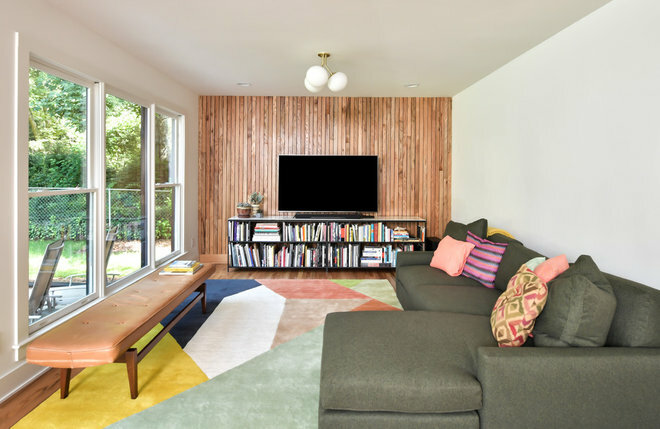 With other projects he’s nailed up 1-by-2-inch wood strips directly to the wall, and has played around with creating diagonal or herringbone patterns or other style treatments. “Having a custom wall or walls in any home easily gives it a higher-end feel,” he says. 25. Glass-and-steel room dividers and interior doors.Glass and steel have been popular materials in recent years for front doors and shower enclosures. But good ideas spread quickly. Expect to see a lot more glass-and-steel dividers and doors between interior rooms. They create an open feel and allow light to pass between rooms while still providing some privacy and noise control. Plus, they just look cool, adding a stylish graphic element or contrasting color to otherwise white walls. Elegant steel-and-glass doors on the left separate this living room by Christine Kimberlee Designs from an adjoining room. 26. Stand-alone furniture benches. Built-in bench seating in a dining nook off a kitchen is highly prized for its comfiness and storage. 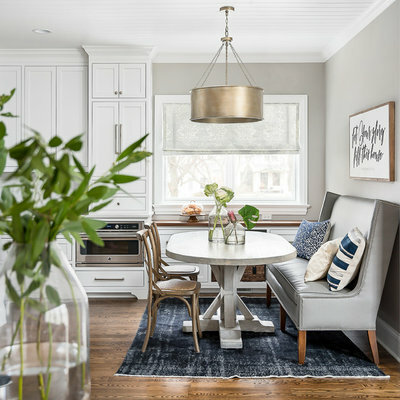 But when you can’t afford the built-in approach, or it’s not practical, consider a stand-alone furniture bench, as designer Amy Storm of Designstorms did in this Chicago kitchen. 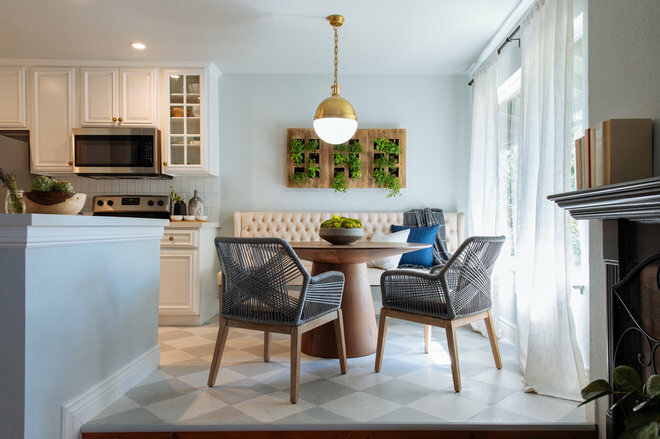 A standalone furniture bench turns almost any dining spot into more of a lounge area, and you could tuck a few baskets underneath to hold blankets, games, place settings and more. 27. Compact laundry stations. Don’t think you need a full-on dedicated room for doing laundry. 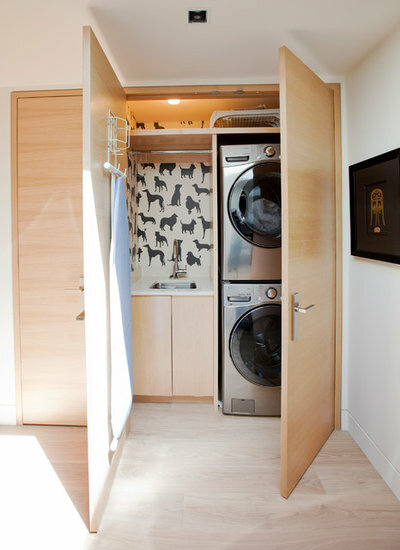 Many designers have created super-efficient laundry areas in spaces the size of a hallway closet.Here, designer Janie Hungerford tucked a laundry station into a closet-size nook of custom millwork in a light oak stain. It includes dog-print wallpaper (Best in Show by Osborne & Little), graphite-colored appliances, a hanging rod and an ironing board on the door. 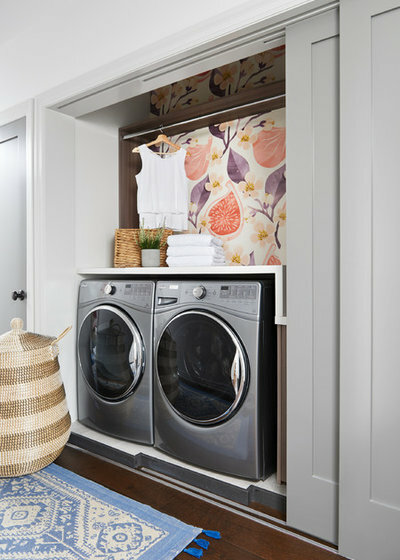 Here, Carly Nemtean and Lauren Poetker of Carriage Lane Design-Build put a laundry station behind sliding pocket doors and added fun wallpaper, a folding countertop and rods for hanging and drying clothes. 28. White board and batten. 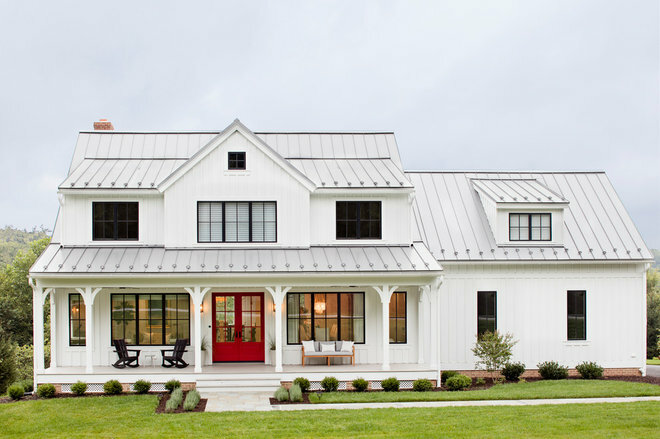 The modern farmhouse look isn’t just sweeping through interiors. Exteriors are also seeing some of that throwback love. Five out of the 10 most popular exterior photos uploaded to Houzz in 2018 featured white board-and-batten siding. A board-and-batten method of construction delivers a charming, homey look and adds texture and interest to what might otherwise be a boring flat facade. And white makes a home pop against any landscape. 30. Ceiling, walls and trim the same color. Ott says accent walls are pretty much over. 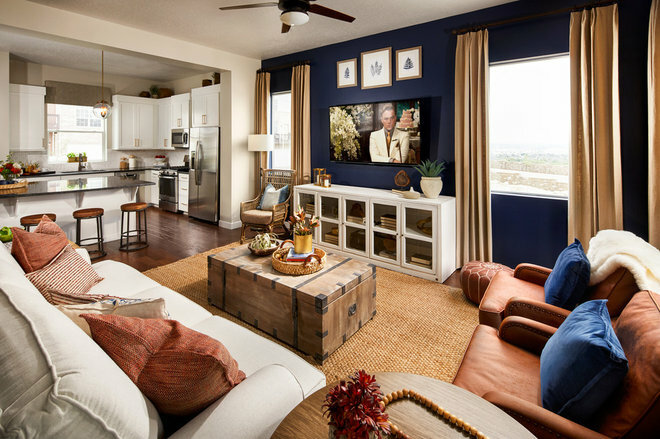 Instead, many homeowners are taking the now-popular moody colors and applying them to every available surface — walls, trim, ceiling — as shown here and in the previous photo. “The effect is a cozier feeling, and gives a more finished result rather than the more jolting effect of just one feature wall,” Ott says. 31. Voice-assisted appliances. Indeed, the robots are here, and more are coming, whether we like it or not. Home tech is a tricky thing. Everyone seems to like the idea of the convenience promised by more technology in the home, but many people find a headache where there should be relief. Still, voice assistants like Alexa and Google Home seem to be here to stay. 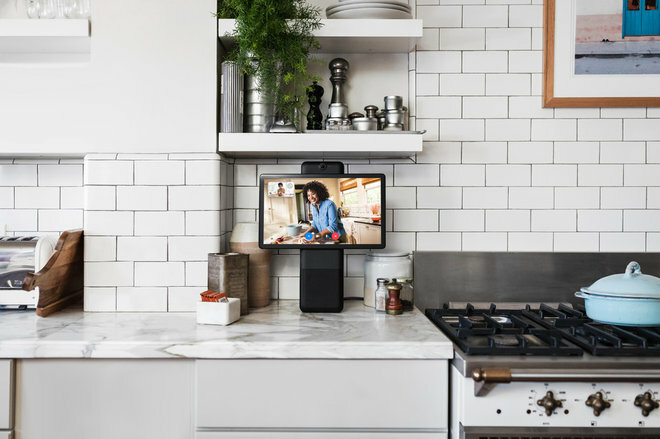 Houzz research shows that home assistants in kitchens, for example, increased in 2018 compared with 2017. And with the devices showing up in more and more homes, more appliances that integrate with voice assistants will become more prevalent. In 2018, for example, Amazon launched its own microwave, seen here. 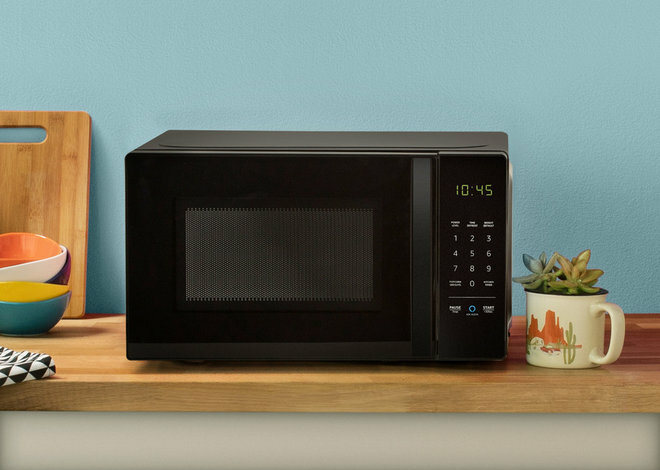 The appliance connects with an Amazon Echo and allows you to ask Alexa, the company’s voice assistant, to “reheat, defrost or microwave your desired cook time and power level.” Whether or not that’s a feature you think you need in your kitchen is up to you. 32. Video chat. In October 2018, Facebook announced Portal, a device with a 12-megapixel camera on the front that allows you to video-chat with your Facebook friends. Put it on your countertop or in your living room and you can make a video call with anyone who has Facebook Messenger — they don’t also need a Portal. It’s a nifty feature that feels like something sci-fi has promised us for a long time. The timing, however, isn’t great. With all the security and misuse-of-data issues now dogging Facebook, some homeowners may think twice about giving the company a literal peek into their homes. Nevertheless, die-hard early adopters will make this something you can expect to see in homes in 2019.